A number of construction and disaster response firms have hired Washington lobbyists to help navigate the contracting process for rebuilding Haiti. In January, Haiti suffered a devastating earthquake that left thousands dead and millions homeless. Since then, the U.S. government and its international allies have pledged billions of dollars in aid to get the impoverished island nation back on its feet. This entry was posted in Earthquake, Haiti and tagged Haiti, United States Congress by recoverydiva. Bookmark the permalink. 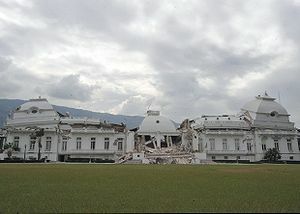 The Haiti Earthquake is actually a domestic disaster which this White House failed to understand. By the 2012 election it will be one of the lowpoints of the Obama Presidency just as Rwanda was for William Jefferson Clinton, as he has now stated publically upon reflection. In fact Clinton has described his failure in that event as a major failure of his administration. In the meantime, 1.5M in Haiti without proper shelter, food or medical care.